for its world music and unique cuisine in South Harlem. B, C, 2, 3 Trains to 116th St.
We'll be playing for Burley's 6th Anniversary, so come celebrate with us! Our debut at this rocking homegrown brewpub & production brewery, serving as Indiana's 1st brewery since 1939! and pizza and beautiful riverside views in a laid back, living room atmosphere. Located on Broadway, this barbecue place serves what is often called, the best BBQ in Queens. Everything on the menu from the brisket to pulled pork is juicy and just about delish! We'll be playing Mo' Beat Mondays with Gridline. Les Nubians, Los Hacheros, Monophonics, Red Barat, Stooges Brass Band, Slavic Soul Party, Underground System, Femi Kuti, Seun Kuti, Chop and Quench, Karkiatura, John Brown's Body, Spanglish Fly, King Holiday, Janka Nabay, Quincy Vidal, and many others have played the series. We're playing Sofar Sounds at a secret location in NYC on May 3rd. Chicago, Jethro Tull, and Santana! Tickets available here! Weekend long beer festival at this rustic brewery/taproom. Laid-back bluegrass & jazz bar with drink specials, a jukebox & live local & national acts. Housed in a century old mortuary, Phoenix Brewing Company, originally in ruins was brought back to life thus its namesake. Beer is brewed in the basement (the former embalming area) and served in the tap room/bar, where the chapel used to be. 6 flagship beers are served on tap year-round, while also rotating roughly 30 other seasonal beers. Phoenix offers an authentic pub experience with live music. Live studio session and interview on Chicago's local NPR station for Vocalo Radio. near the east end of the Pier, between Festival Hall and the Grand Ballroom. Taproom serving a range of craft brews, with artisanal pizzas & salads, plus music on weekends. Family owned & operated breweries located in the Lehigh Valley. Join us as we join our friends from Madam West for this one! Time TBA. C to Washington Ave, 2/3 to Brooklyn Museum/Eastern Parkway or Q to 7th Ave.
A / C train to 145th St.
We'll be returning to Jules Bistro, a Frequent Friday spot for us 8:30-11:30pm. Come join us for food, drinks, and a great night of music! Come join us as Gentleman Brawlers & NeMiss Chiyork hit up DROM for a night of funk & dance. Presented by L4 Black Door & RahRAHRAH! We're starting the night with some dancing funk jams with Banda Magda joining in after! Join us for great eats and music as we venture down to Red Hook to play at Hometown Bar-B-Que. F/G to Smith-9th St. then B61 to Van Brunt/Van Dyke St.
Have you guys heard Jules & the Jinks!? They're amazing! We'll be returning to Williamsburg to play a show with them on Friday, Oct 9th at the new Living Room space. Snoop Dog, ZZ top, Alice in Chains, and 3 Doors Down! Tickets available here! The Brawlers are thrilled to bring music back to Bunna Cafe, as the cafe hosts bands every Wednesday night starting April 1st. In addition to good music, Bunna Cafe boasts wonderful Ethiopian food, tea, and coffee, so bring that appetite! "I am a great admirer of mystery and magic. Look at this life-- all mystery and magic!" -- Harry Houdini SUNDAY JUNE 14 from 7-10:30pm @ the Brooklyn Air Space (132 Bedford Av) we warmly invite you to celebrate and explore the life of magic and mystery which Harry Houdini speaks of-- through music, dance and acrobatics. Mingle and move in a creative jam environment where one of NYC's most critically acclaimed and emerging bands-- Gentleman Brawler's -- will fill a huge 3-part art space with sonic experimentation and intense songs. (SW corner of Frederick Douglass Blvd/8th Ave) B, C, 2, 3 Trains to 116th St.
We'll be playing Bushwick Open Soul at the Pine Box Rock Shop, as part of Bushwick Open Studios!! DJ KING EULAS will be spinning throughout the night and after the bands. JOI "thegodis" SANCHEZ will also be MC'ing the event. Come out of hibernation with us as the Gentleman Brawlers play The Bitter End next Thursday night, March 19th @ 10:30pm. Hey guys! Looking to escape a little hibernation!? Come join us as the Gentleman Brawlers Afrobeat Project plays Groove on Sat. Feb 28th! We'll be opening up for funk legend band Li'nards Many Moods from 8-9pm. Hope to see you guys there! Make my dreams come true and come join us as we venture to Daryl's House (yes that Daryl) and play an infectious set of dancing tunes. This will also be a birthday extravaganza, so don't miss out on some well-promised maneating good times ;) We're arranging transportation for our NY peeps, so let us know if you're interested! Come join us as we come back to the Knitting Factory, playing with our friends Fall Down Town and The Rally!! The Gentleman Brawlers are playing a show this FRIDAY NIGHT, 9PM AT SPIKE HILL, as we say goodbye to one of our most favorite places to present our music. That's right – Spike Hill is closing!! We can't believe this wonderful venue, perhaps the best live music room in New York City for emerging bands, must close its doors. But let's not dwell on the negative! Instead, let's celebrate this wonderful venue and its mark on the Brooklyn music scene — with its tight combination of top-notch professional sound and laid back, friendly staff — and give Spike Hill a great Send-Off Party. These folks deserve it! Speaking for ourselves — the Gentleman Brawlers wouldn't have got off the ground without them, who have been wonderfully supportive and offered us the flexibility to curate entire evenings of music, finding our identity on their comfortable stage. Come party with us on Friday, and raise a toast to Great Times and Great Music! FREE Show / Drink specials all night! We're starting the night with some dancing funk jams with Ikebe Shakedown joining in after! We're funking it up with 2 hours (yes, 2 HOURS!) of dancing jams to get your Friday on. We're making our way out of Brooklyn for this one at Silvana, an institution known for its world music and unique cuisine in South Harlem. Come join us for this FREE event from 8-10pm with our friends Super Yamba Band joining in after! Come join us at Spike Hill as we gear up for our Fall lineup! We've got new tunes, new peeps, and a few surprises along the way. Friends Zebros, Glorius Veins, Miracle Fever, The Big Parade join us. Start the year right as we kick off our 2014 show lineup. Friends Miracle Fever, Easy Lover, and Zebros join us. Beat hump day with us as we play at the Delancey this coming Wednesday night. Friends Matt Keating, Clarence, & Love X Stereo join us. F train to Delancey St. or JMZ to Essex St.
Did someone say radio!? Next Tuesday, Oct. 22 (8-10pm) the 'Brawlers will be joining radio hosts Matt Townsend & Rachel Brown on WPIR Pratt Radio for an episode of the Rodent Hour! We'll be playing tunes in between eating cornbread & chili, so follow the link to tune in from 8-10pm. Come join us at Spike Hill as we gear up for our Fall lineup. Friends Katy Steele, Sioux Lion, & Anais Aida join us. The Brawlers are coming back at Spike Hill, so knock back those summer kicks with us! Friends the Zebros, Katy Steele, Miracle Fever, and Sioux Lion join us. Come join the Brawlers as we hit up Arlene's Grocery next Friday night (yes, you heard us a FRIDAY!) March 29 @ 9pm. Great music line up that night and a few surprises promised from us! Arlene's Grocery | 95 Stanton St. This Friday, March 1st @ 7pm we'll be battling it out LIVE on the radio/internet for your VOTE in WNYC 93.9 FM's 4th Annual Battle of the Boroughs! Beat out the line & buy tickets or, better yet, WATCH & VOTE from the comfort of your own home! We'll post a link to the Livestream & voting details this Friday night - so look out for that & we'll see you Friday! Come join us as we play some experimental new tunes (yes, you heard it, new music!) alongside 2 other awesome bands, Birthmark and Phone Home. The Brawlers are getting cozy at the Living Room, so get warm and boogie with us!! The Brawlers are coming back at Spike Hill! We've got a new bassist and a new drummer, and they're killin' it. Friends the Zebros and Sunset Guns (nee Captain Skyhawk) are joining us. 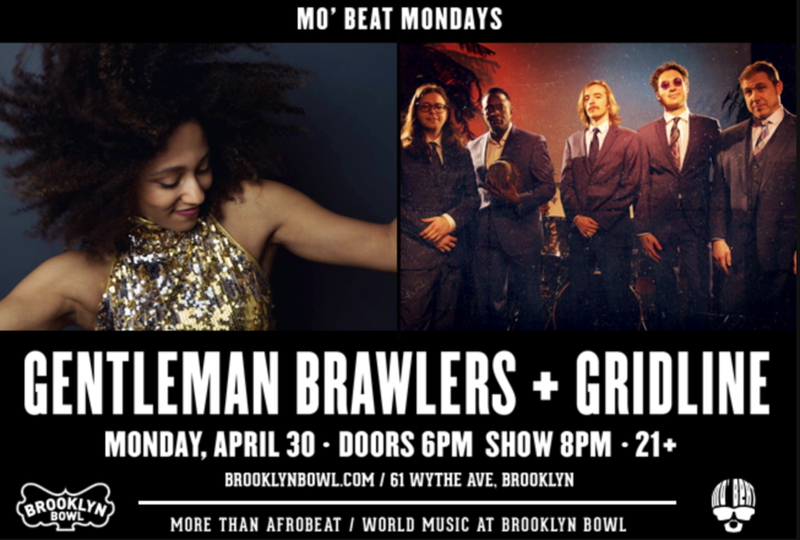 Come kick it with the Brawlers at one of Williamsburg's most fun music venues. We'll be sharing the stage with our friends U SAY USA, Coastguard, and Stereo Soul Future so bring your dancing shoes folks! Celebrate the launch of the Gentleman Brawlers new single "I Ain't No Brian Wilson" on the Occupy This album with a night full of music, videos and more. Dress to impress for this 1% themed event! F train to Delancey or JMZ to Essex St.
A special encore performance at one of our favorite bars for St. Patrick's Day! 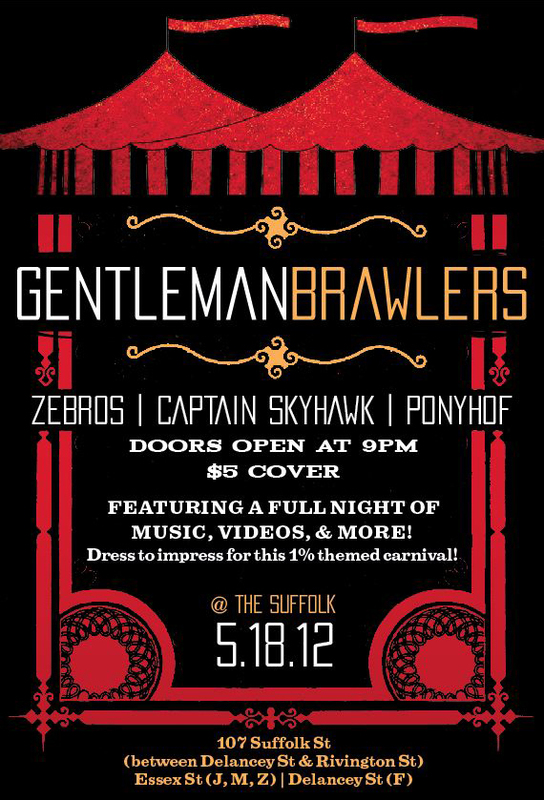 A full night of music from the 'Brawlers, The Zebros, and more! Also, an excuse to celebrate our friend Megan, who is getting older, again. A special acoustic guest performance for StepPlay Dance Company's show, "Present". We're shooting a live video of this gig, also enjoy U Say USA, Michael Huntley, and Joel Lederer. 2 3 4 5 B D N Q R trains to Atlantic Ave., walk 2 blocks down Atlantic to the corner of 3rd Avenue. Come see us at the new Freddy's location in South Slope! With Tres Amigos. Sponsored By Smutty Nose Beer! We booked this one especially for our friends who work in the city—don't even go home, come join us for an early show right after work! Help us celebrate Barcey's 1-year Anniversary! We'll be playing a special acoustic set at this charming new Bushwick coffee shop. 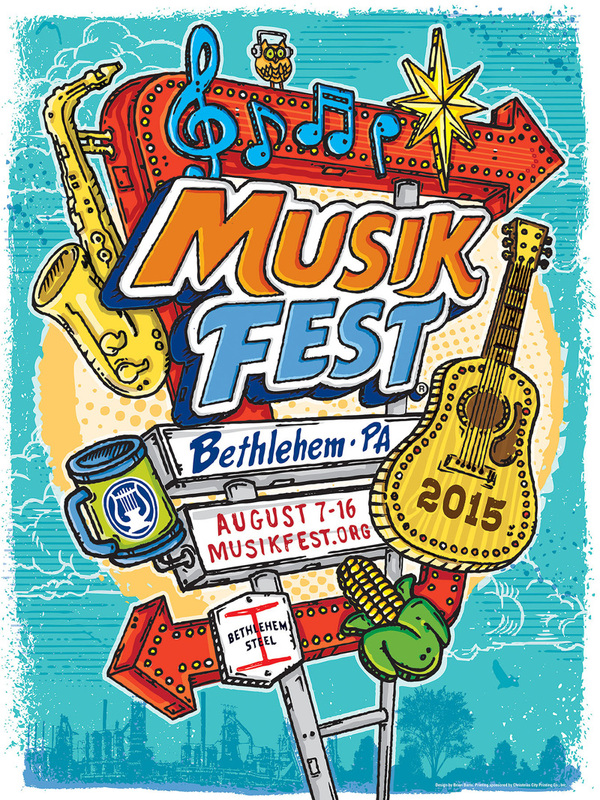 Come see us at the best roots music venue in the Village! Join us for a great night of music on Avenue C!